“Coal kills.” Or can it possibly be “clean”? The presidential candidates debated the issue because coal remains central to our traditional energy production, which now contributes greatly to pollution, damaging of the ozone layer, and the human toll on those who work in the industry. We know continued reliance on such carbon-based energy will be environmentally devastating. You don’t need to be trapped in a suffocating coal mine to feel the heat. As the earth’s ozone layer erodes further, exposing us to the sun’s ultraviolet rays, we’ve just experienced the warmest 12 months — from July 2011 to July 2012 — in US history, the worst Midwest drought in decades, and an increasingly bizarre — but explainable — profusion of extreme weather events, like Hurricane Sandy. Daughter of a miner family, Kathy Mattea took a big step toward raising awareness of coal mining’s most pressing issues in her brilliantly provocative 2008 album Coal ( Captain Potato Records). Her new CD, Calling Me Home, finds her back on a larger label (Sugar Hill) and perhaps expanding her audience reach, with more artful symbolism than death-rattle spookiness. But she’s still fearless. “Maple’s Lament” has a dead tree as its narrator. “Hello, My Name is Coal” wittily encapsulates the industry’s political paradoxes. http H/www.youtube.com/watch?v=Zrm1rPa3mLI “Black Water” depicts a mountain’s decapitation and living among coal-poisoned streams. Mattea’s alto voice — a stalwart beauty — employs the witness of pioneering Appalachian songwriters like Hazel Dickens and Jean Ritchie, with luminous harmonizers like Emmylou Harris, Alison Krauss and Patty Loveless. Kingsolver pinpoints the universal chord that Mattea has struck on this recording. Politically loaded as the topic of coal is, the experience of home is nonpartisan, so Mattea appeals to our sense of what is worth preserving because it is an essential part of us — the shoe mud on rainy-day walks, childhood sing-alongs, dinner aromas in the kitchen, cheating at game playing, fraught holiday gatherings, crazy laughter, petty jealousies, preciously shared memories, secrets and shame and intense pride and gratitude. And she transports us to Appalachia and makes it feel an awful lot like our own home — even if you’ve never been there. I finally drove into that near-mythical and misunderstood region in June, and its stately mountains and open-armed valleys infiltrated my being in a way I hadn’t expected. So when I arrived with my sister Sheila at the Blue Plum Music and Arts Festival in Johnson City* at the eastern tip of Tennessee, I was primed for artists like Guy Clark, Darrell Scott and Malcolm Holcombe, with comparable ability to press on the pulse of the American home experience wherever it may lie (I’ve blogging on all three artists on this site). 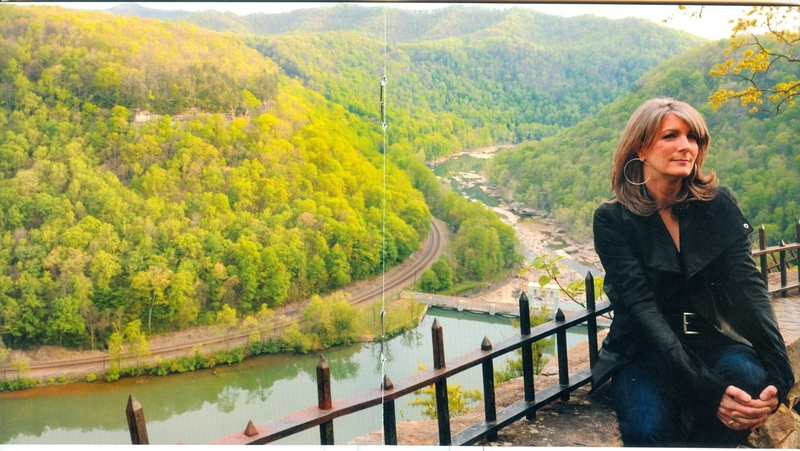 The centerfold photograph of the liner booklet for Calling Me Home, Mattea sits before a stunning backdrop: a river winding through golden-green mountainsides. and I feel no more the wind and rain, as when I was a tree. One wonders what today’s climate-change deniers think kills such maples. Other “trees and plants,” as Ronald Reagan infamously blamed for air pollution? Many of Mattea’s male relatives labored for years in the coal mines and paid the price, with black lung disease, or far more sudden death. (from “Calling Me Home” by Alice Gerrard). Here, as elsewhere, Mattea’s voice uncovers layers of emotional depth while always radiating a resolute fortitude that never succumbs to easy sentimentality. And her focus on her home state of West Virginia underscores the economic reality people there live with — of losing jobs as well as their lives, and the fact that industry and political forces an Appalachia resist diversifying solutions to the inevitable decline of this non-renewable resource, which is coming closer to being tapped out in the region, according to Ken Ward Jr. in a recent article in The Nation. The activist group coal River Mountain Watch and the consulting firm Downstream Strategies have suggested that building wind energy farms on some Appalachian peaks is the better long-term goal than “blowin’ ’em up real good” to get at the coal. During my drive to Tennessee, I was captivated by a huge wind farm in Indiana with hundreds of turbines spinning beside the highway. 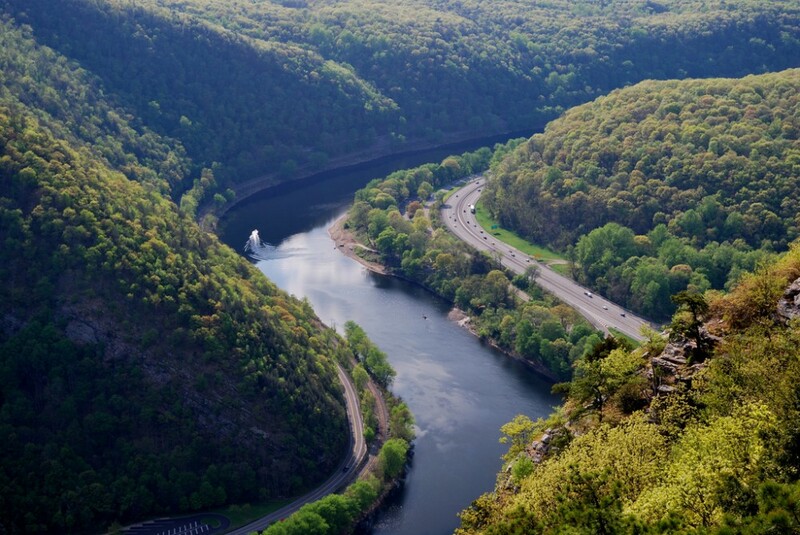 How much more elegant and ecological would be one of these slender white turbines atop a blue ridge mountain, to make use of, and do justice to, its splendid height? Throughout the album, Mattea and her guest harmonizers ride the supple, glimmering accompaniment of ace contemporary bluegrass musicians, including Stuart Duncan, Bryan Sutton and Bill Cooley, who penned “Requiem for a Mountain,” the instrumental which quietly closes the album with pure sonic vibrations rather than words, like whispering zephyrs and murmuring rivulets mourning the defiled majesty of yet another decapitated peak. 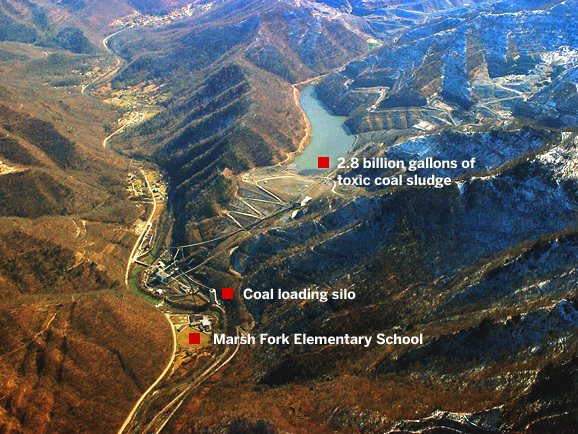 In this photo/graphic, a decapitated Appalachian mountain has produced a lake of toxic coal sludge which hovers over a precariously close elementary school. Courtesy of the blog After Gutenburg: Just Another Pretty Face. So Mattea is growing more sophisticated in her rhetorical skills as an artist. Though she now lives in Nashville and is a two-time Grammy winner, she’s hardly a typical peroxided country star. Coal was nominated for a Grammy Award in the Traditional Folk category. Her cover of Nanci Griffith‘s “Love at the Five and Dime” was her first major hit in 1986, (and earned the just-emerging Texas alt-country Griffith notice as a songwriter). Unsurpisingly, Mattea’s an environmental activist. She currently travels the country presenting Al Gore‘s renowned and still provocative environmental film An Inconvenient Truth and speaking about the importance of fighting global warming and the environmental and physical devastation of mountaintop-removal coal mining. Mattea clearly prefers whole, thriving Appalachian mountain ecosystems and humans. *Mattea’s next advocacy speaking apperance will be in Johnson City, TN on November 12 at “The Arts: Remembering Who We Are” Artists-In-Education conference at East Tennessee University-Millennium. Political comments, even if they are the artist’s beliefs do not help the record to be heard. This artist has certain beliefs but to insinuate that she would dislike other people of a different political ideologies is a disservice in helping to protect everyone’s home. The earth is a sister and not my mother. It is family but not the creator. It is a gift from God, not God. Remembering this will help environmentalists understand conservationists . It is more than politics . Politics divide. This artist is not about division. And humans. I don’t insinuate anywhere, that she dislikes any people. She may dislike the political and corporate powers that perpetuate an industry that’s unhealthy for the planet, but to suggest that an industry or a coal company is human (“other people”) is like saying corporations are human, the deeply flawed logic of the “Citizens United” Supreme Court ruling, which gives bottom-line, human-dominating corporations powers that only real humans ought to have. Is this the ideology you refer to? Or is it one that says we need our jobs even if they kill us? I know that’s a tough issue, but Mattea hardly dislikes the people with such a plight. Her music expresses her love of such humans deeply because she knows intimately the coal miners who have suffered and died horrendously — her own family (this is even more evident on the album Coal.). And she understands by extension the larger human family paying the price for industrial greed. Yes, human qualities like greed manifest themselves in industrial practices but that does not make the industry itself a human being. And she cares so much because she’s singing about her home — the sentiment that truly dominates this album. I hope this makes sense to you, and please feel free to respond. Thanks for commenting.